Al Bartlett is no longer with us but his wisdom persists. This quotation comes at a time when economists and governments are scrambling to address the fact that in the western civilized world, population has stabilized and is below replacement in many countries. For people with a brain this is good news, the only extant example. For those fixated on continued and expanded production and consumption, it is worrisome. This shows you how ignorant and also how malicious these people are, in hoping for a process which can only accelerate the total collapse of the world’s ecosystems and societies. The projections of a world in 2050 of 15 billion people is of course utter nonsense, because Nature Bats Last and long before that date many of these people will die (thus inadvertently contributing to population control). Right now there are an estimated 22 million refugees in the world, which is probably an underestimate if you include people living on the edge of starvation but who, for various reasons, have not been able to move elsewhere. They will probably die before they can move, and the refuges for them will continue to diminish. 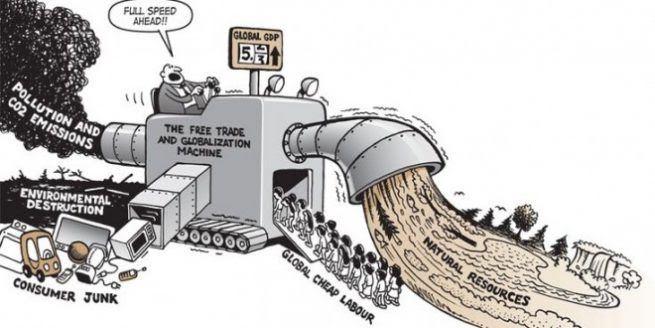 It is alarming and staggering when one realizes, in reading about economies,globalization,free trade and related issues, that those making declarations about the need for increased economic growth, workers and consumers, have not altered their views or demands one iota. Even the most progressive and informed blogs, journals and newspapers fulminate over economic inequality, corporate greed, the affluent 1%, and poverty, there is almost NEVER any reference to the global crises of climate change and biodiversity, much less to their aftermaths of disease, famine, drought and collapse of agriculture (mainly due to the lack of water for irrigation). Only blogs like Post Carbon and Cassandra get the story straight. Read Dissent, The Nation, and all the others. You won’t get the truth. The public, the entire citizenry of the world, is being lied to. Deceived. Intentionally. Anyone who has taken the trouble to do serious research in credible sources will understand this instantly. The reason is simple: capitalism. The only thing that can save humanity, or rather the developed technological world, is a rapid devolution away from capitalism. It is NOT compatible with preserving humans or the planet, not any more compatible than religion is with science (another favorite deceit). Capitalism is not just profit. It is growth. Growth is what it breathes and lives on. Without expansion of production and consumption, capitalism slumps. And with cheap energy, it grows, hence the opposition to a carbon tax and to higher energy prices, which curb consumption. There is no wiggle room. The choice between life and capitalism will become clearer day by day. The incompatibility will become obvious to more and more doubters who whistle in the dark and hope for a renewable energy deus ex machina. The writings of Richard Heinberg of the Post Carbon Institute and of Ugo Bardi of the Cassandra project tell it like it is. We need to listen and then wake people up. For anyone seriously looking for more information on the incompatibility of capitalism with a healthy and peaceful life for all global citizens check out this site which has a wealth of information on many separate topics.